I was born in Canada and grew up in a log cabin in Quebec. My childhood was spent playing in the forests and messing about on the Gatineau River. It was a wonderful wild time and in many ways is the source of all of my writing. 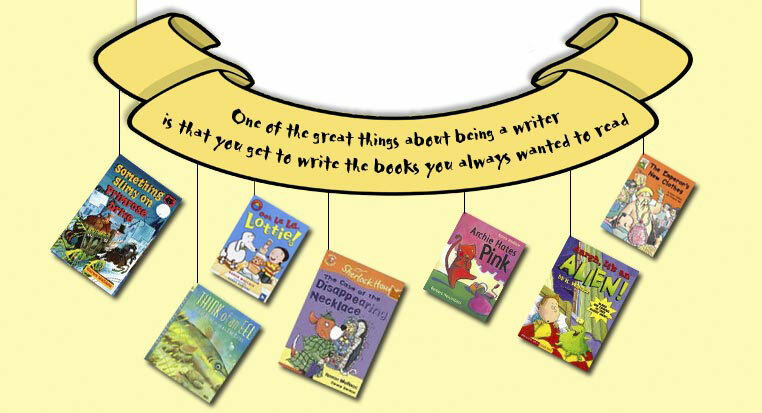 Children’s writers are an eccentric bunch. Someone once said they never grow up and in many ways, this is probably true in my case. I write books for children from five to fifteen years old. The ability to recall how you felt and what your world was like at a particular point in your childhood is something that all children’s writers share. It’s like pushing a rewind switch and going back in time. Many of my natural history books for children, like THINK OF AN EEL, which won awards on both sides of the Atlantic, IMAGINE YOU ARE A TIGER, or I AM A TYRANNOSAURUS REX all reflect my own sense of wonder exploring the woods and the river around me when I was a child. Years later, I wrote about this childhood in my first novel RASPBERRIES ON THE YANGTZE, which was shortlisted for the Guardian Fiction Prize.
! In the early 1960s, I came with my family to England and was sent to a boarding school. I lasted about eighteen months before leaving to go to a day school and wrote about this experience in my second novel, CLIMBING A MONKEY PUZZLE TREE. After leaving school, I went to London University to read English. At that time, there was a great emphasis on the study of Anglo-Saxon literature. So I read many poems that were written in such a way that they would be remembered and re-told again and again since very few people could read or write. The deceptive simplicity and the strong internal rhythms of the poems came back to me when I began to write picture book texts and short dramatic narrative non-fiction. I have done all kinds of jobs in my life. I’ve worked in public relations and run my own publishing company. I’ve made pizzas and sung in a cabaret act and a bluegrass band. But when I am asked whether I always wanted to be a writer, I say, yes. Making up stories is something I’ve done all my life. My most recent teenage novel is EMERALD which is set in Tudor times. I have always wanted a pet bear so I gave one to my heroine. The bear is called Molly and it’s a great read! Also STICKY STORY BOOKS are finally available for Christmas 2013. This the first time I have ever designed a book and they look amazing, thanks to Hachette and Jo Lodges artwork and last but not least, a strong suction disc which means they can go anywhere! I write scripts for children’s television, natural history programmes and the occasional documentary. Script writing uses a different writing muscle, but it’s still about telling a story. In most cases, I have chosen my most recent books for this website. There are all kinds – from picture books and Beginner Readers to comic novels and teenage fiction. I hope you will enjoy reading them as much as I have enjoyed writing them.